Estimate your sprinkler output using the "can test"
Roll your mouse over each step to see it illustrated. 1. Evenly space six or more straight-sided food containers, such as tuna cans or cat food cans. 2. 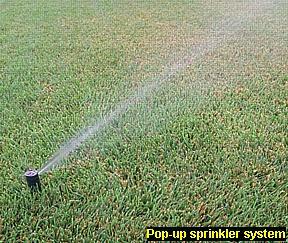 Run your sprinklers for 20 minutes. 3. Measure the water in each can with a ruler. Average the depths of water by adding up the measurements and dividing by the total number of cans you used. Multiply the average by 3 to estimate how many inches of water your sprinkler system puts out in an hour. Round to the nearest half-inch. Use this number to help schedule your irrigation.